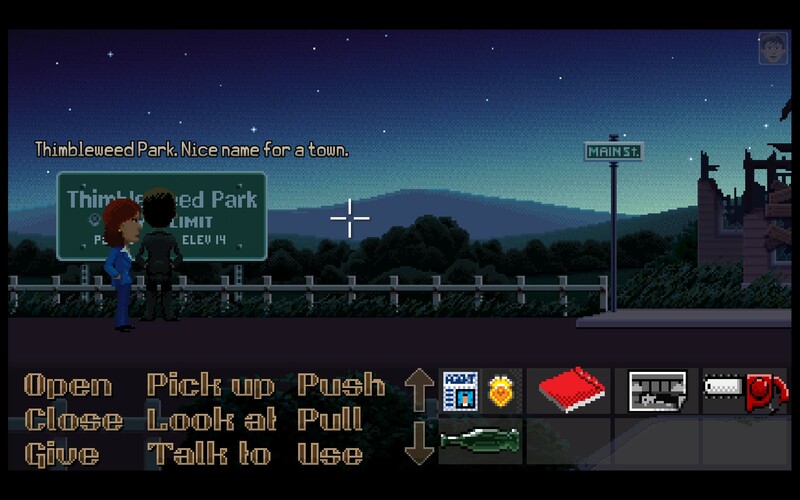 Thimbleweed Park was Kickstarted back in 2014 and promised a brand new game in an old genre, a return to the classic point-and-click adventure titles produced by LucasArts in the late '80s and early '90s. The title has an impeccable pedigree since both Ron Gilbert and Gary Winnick made their names working on one of the first adventure titles ever made, Maniac Mansion. In fact, Gilbert is credited with introducing the concept of cutscenes to video games as a way of transitioning between two action sequences. Thirty years have passed since Maniac Mansion's release, and the genre it exemplified has died, been reborn, and relapsed into a coma. You don't see too many point and click adventure titles these days, as story-driven games don't need to rely on the old adventure formulas to get their message across anymore. It's been nearly two and a half years since the Kickstarter closed, and the game is finally releasing today. 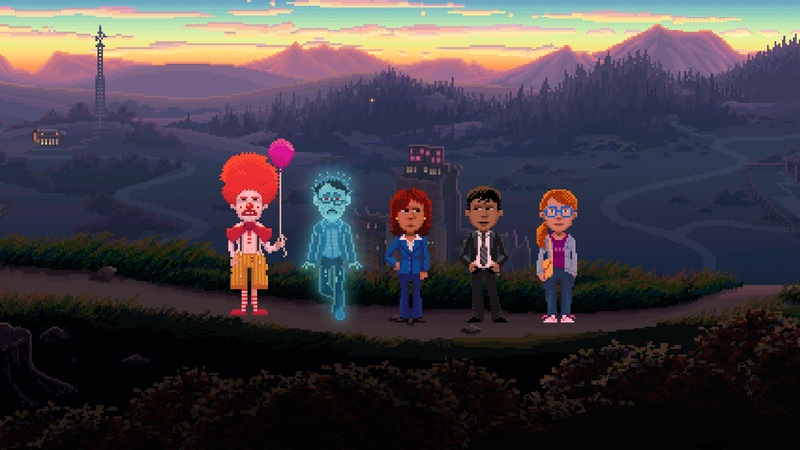 It's already been a great month for games, so how does Thimbleweed Park stack up? Thimbleweed Park lets you take control of five very different characters, each with their own skills and specialties. You'll move them around the town, picking up anything that isn't glued down to try and figure out the mysteries that surround you. It's set in 1987, though there're some anachronisms to be found if you want to get pedantic. The story begins as a murder mystery, and borrows some of its trappings from several early '90s favorites like Twin Peaks and The X-Files. Later on, there's even some stuff in there that calls back to The Matrix. It does a great job of setting the mood and maintaining tension, even though you can play at your own pace and there's only one (easily avoidable) way to get yourself into a failure state. While each character is mostly self-sufficient, there are a few puzzles that will require two or more of them to work together. Fortunately, they can share almost anything they find with the other characters as long as they occupy the same physical space. The game teaches you this early on, as you must use the GIVE command to make sure the same character has both the film and the camera required to take a picture. Once this is taken care of, you can switch between the controllable characters at any time by selecting the person you want to play as using a drop-down menu in the upper right. The nine verbs in the lower left of the screen are how you interact with everything in the world, and you can also use them on your inventory, to OPEN a package or combine two items with USE. While you can click a command every time for a dose of early '90s nostalgia, you can also use the keyboard shortcuts on the left side of the keyboard. Thimbleweed Park does support a controller on PC, but I elected to play it with a mouse and keyboard for the authentic experience. Thimbleweed Park sold itself on nostalgia, and for fans of the adventure genre, it more than delivers on that promise. There are many, many references to past games, more than I could count. For example, it seems as though Dave and Sandy from Maniac Mansion settled down here to run the town's diner. The Edmund Mansion mansion bears a striking resemblance to the Edison's abode. There's even some puzzle callbacks, action sequences that'll give you a bit of déjà vu if you've memorized the puzzles in The Secret of Monkey Island or Maniac Mansion. Stuff like this doesn't detract from the story and would probably sail over the head of anyone who hasn't played those previous titles, but it's a great bit of fanservice for people who grew up with them or discovered the remakes later in life. 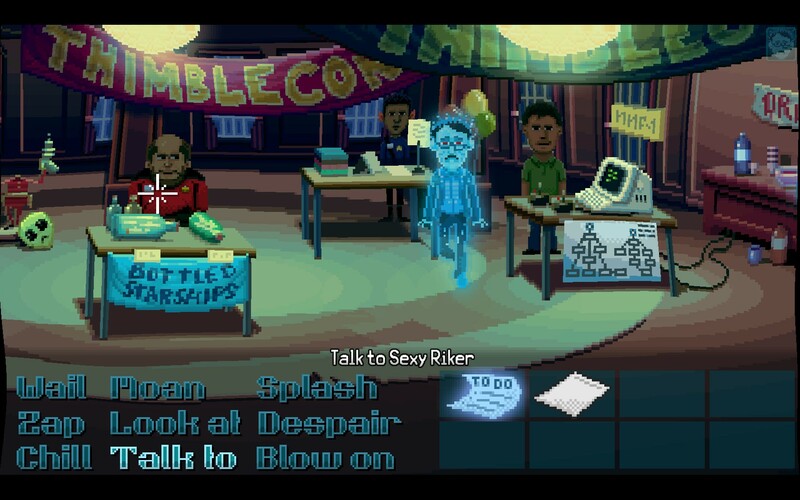 While Gilbert and Winnick have every right to rest on their laurels, Thimbleweed Park surpasses their earlier work by a considerable margin. Adventure games are more about establishing characters and setting a mood than about action, and the town and residents of Thimbleweed Park have personality to spare. From the abandoned carnival to the vacuum tube store to the defunct pillow factory, every setting and character is distinct and memorable. This is helped by both the spectacular pixel art and the full voice acting, something that wasn't possible when the duo first teamed up on Maniac Mansion. The art has some modern touches, with dynamic lighting and other special effects added where appropriate. The precise, handcrafted pixel artwork fits the quirky story well, and there's even animation that matches the characters' mouth movements to the English dialogue. Speaking of dialogue, the voice work is excellent, even though the actors all seem to be new to the genre. Each of the main characters has a distinct personality that comes through in their dialogue. Ray is world-weary, Reyes is upbeat and a little naive, Delores is optimistic even though her family is falling apart, deceased pillow salesman Franklin is convincing as a total doormat. 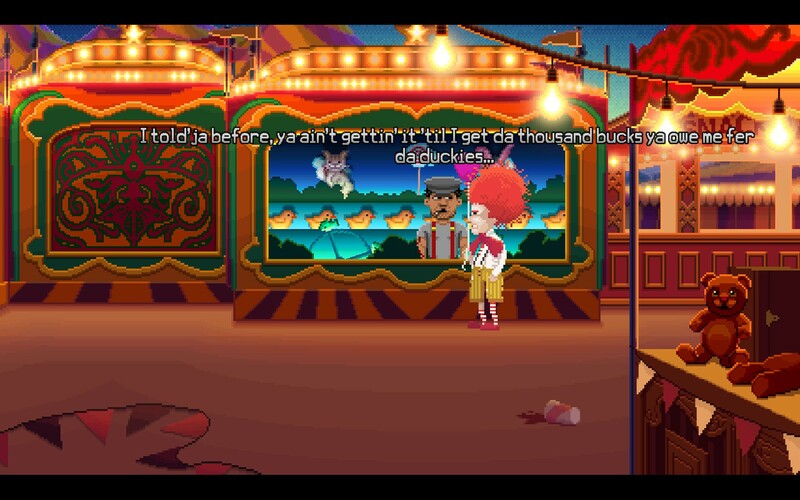 Cursed clown Ransome is annoying, and the gravel-voiced Simpsons character Krusty the Clown is a pretty clear influence, but he's meant to be unpleasant. 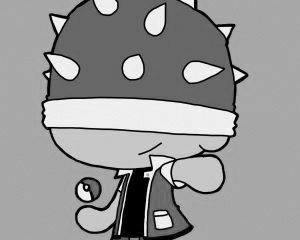 It's probably not a coincidence that he's the character who absorbs the most physical abuse throughout the course of the game. Each of the characters has their own arc and tasks to accomplish, and you can check their agenda by looking at their personal to-do list at any time. While most inventory items can be shared, some are tied to a specific person, which helps differentiate the cast. Aspiring game developer Delores is the only one who can solve computer and programming related puzzles, and she's usually in charge of repairing the town's vacuum tube-based technology. Additionally, some characters can go where others can't. Ghostly Franklin is stuck haunting the site where he met his demise, jerkass clown Ransome won't let anyone else inside his trailer, and the federal agents Ray and Reyes are the only ones who can access specific crime scenes. While the actions you have to take can be skewed at times, there's a consistent internal logic that makes the puzzles solvable if you pay attention to your surroundings. I only got really stuck once, and that was because I never bothered to LOOK at the corpse I was supposed to be investigating at the beginning of the game. If you get stuck working with one character, it's easy to switch to a different one and focus on one of their tasks for a while instead, and doing so might trigger a brainwave about what to do on that first character. Once you have no further use for an item, you can use one of the town's many trash receptacles to toss your excess inventory, and you can be confident you won't need it because your character won't discard anything that's still useful. It's a nice touch, and helps keep the puzzles from feeling overwhelming. I particularly liked how Kickstarter backers were credited. Instead of a lengthy list of sponsors in the game's credits, backers above a certain funding tier were given the opportunity to add their name to the Thimbleweed county phone directory, or to write a short passage that can be found in one of the town's libraries. This is a callback to the funny book titles that were often found in LucasArts titles, and lets backers find their contribution as sort of a personal easter egg. It also makes sorting through the irrelevant names or titles to find something you need part of the puzzle. Fortunately, the people you need to contact to complete tasks are highlighted so they stand out on the page, and it's easy to find the correct titles in the library by using the provided index. I admit it's a petty gripe, but I was slightly annoyed to see that misspelled words and mistakes made by backers weren't corrected before being imported into the game. I understand that this would have been a lot of extra work for the developers, but feel that it makes things look a lot less professional. Fortunately, the backer books are easily ignored if you're not interested, and you'll be able to go to the correct titles without pixel-hunting for hours. If for some reason you DO want to pixel-hunt, there's an optional side quest that involves finding a single piece of dust on every screen. 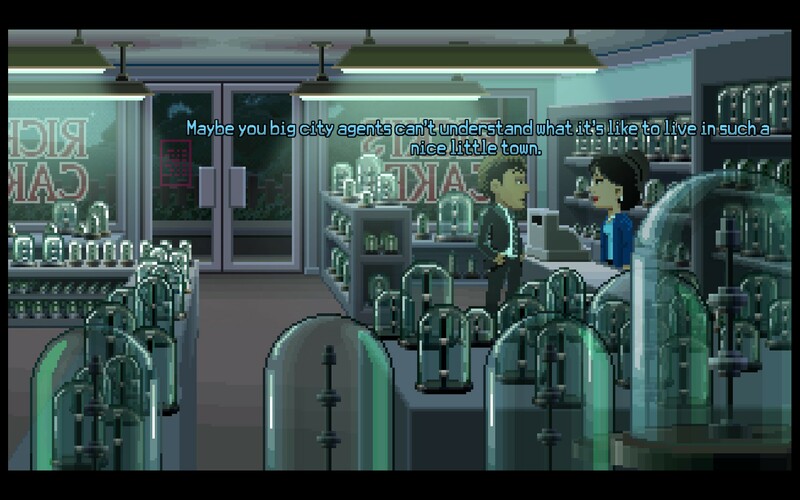 As much as I enjoyed Thimbleweed Park, it's not perfect. There's a lot of backtracking, which, although endemic to the genre, can become frustrating. This is mitigated somewhat once each character has a map of the county, which allows you to travel between destinations much more swiftly. You're still going to run back and forth a lot though, and you'll probably spend a good chunk of time waiting for the damn elevator in the hotel. Only one character can use it at a time and there's no fast travel between floors, so if you want to take your whole crew to the penthouse, they'll have to take turns and wait. A "group up" or "meet here" command would have been a godsend for juggling items between the various inventories. There's not really a story reason for the five characters to start working together, other than the fact that you're telling them to. And while I understand the decision to have different verbs instead of a more generic USE input, there are two or three commands there that frankly aren't necessary. 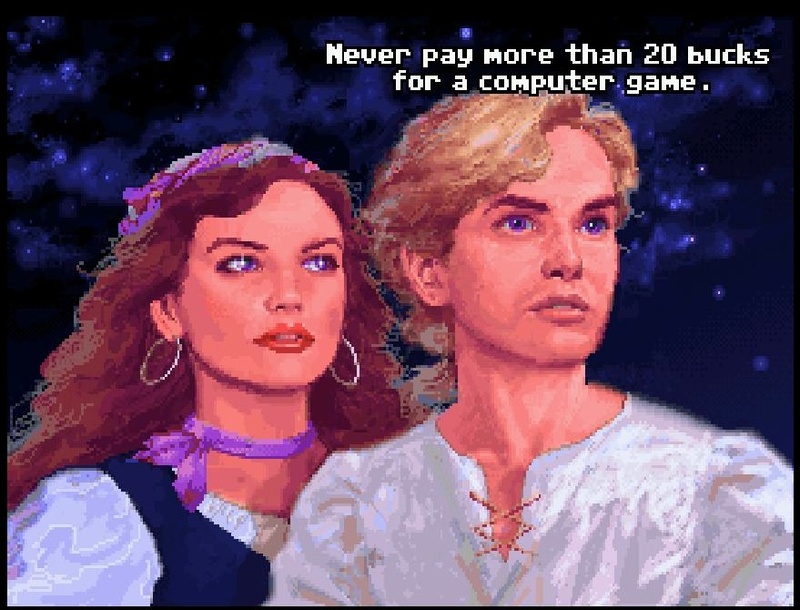 When the Kickstarter for Thimbleweed Park was launched, the stated goal was to create a game that plays like a lost LucasArts adventure title. In my opinion the developers succeeded brilliantly, creating a game that feels like a forgotten relic of LucasArts' heyday, but with enough touches to make it a little more relevant to a modern audience. It's fair to say no one makes them like this anymore, particularly since Telltale discovered a more lucrative formula based on popular franchises and keeping track of player actions. It was a rare pleasure to get to play a game like this again. 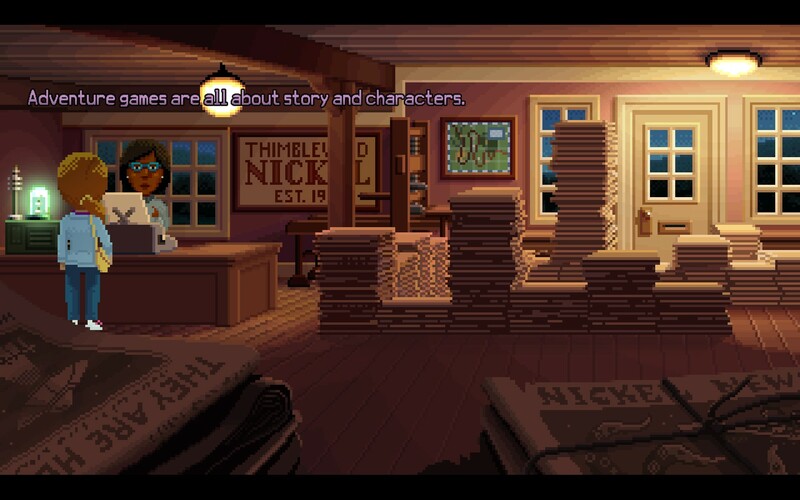 I had a blast exploring Thimbleweed Park, and if you've ever enjoyed telling Bernard Bernoulli or Guybrush Threepwood what to do, you will too.